One major issue that has plagued homeowners over the past few years has been a lack of equity, making it impossible to sell without a short sale. Worse than that, many lacking equity have decided to simply hand in the keys and walk away, a testament to their desperation. But thanks to recent home price gains nationwide, more and more borrowers are acquiring healthy amounts of equity, plenty enough to throw up a standard sale on the MLS if they’d like. A new graphic from RealtyTrac illustrates this equity boom, and Honolulu is tops when it comes to the “equity rich,” despite being surrounded by water. By equity rich, they mean having 50% or more equity in the home. Put another way, having a LTV ratio below 50%, which is quite favorable in the mortgage world. As you can see, 36% of homes (62,891 total) in the Hawaiian capital are rich in equity, meaning these households could all sell whenever they want to without any trouble (barring the circus that is the mortgage industry messing things up). 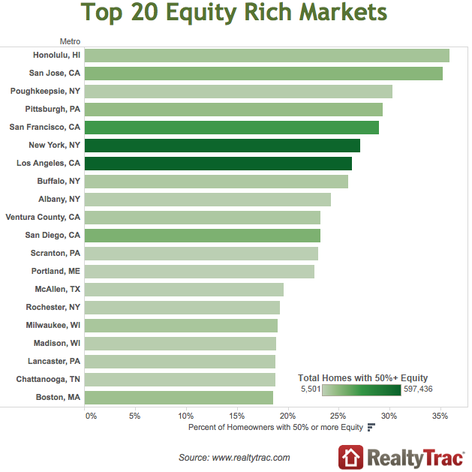 San Jose, CA has the second largest percentage of equity rich homes at 35% (131,622 homes), followed by Poughkeepsie, NY at 30% (25,188 homes). In terms of totals, California has the largest number of equity rich homes at 597,436, or 26% of homes. It’s followed by New York, NY with 578,785 homes (27%) and San Francisco with 282,793 (29%). Unsurprisingly, most of these metropolitan areas are quite affluent, and there are probably plenty of cash buyers in the mix, including scores of investors. They’re also established cities, meaning many homeowners have probably lived in the homes a lot longer than in newer cities such as Las Vegas or Phoenix. RealtyTrac also took a look at homes in the process of foreclosure that now have equity thanks to those recent price gains. 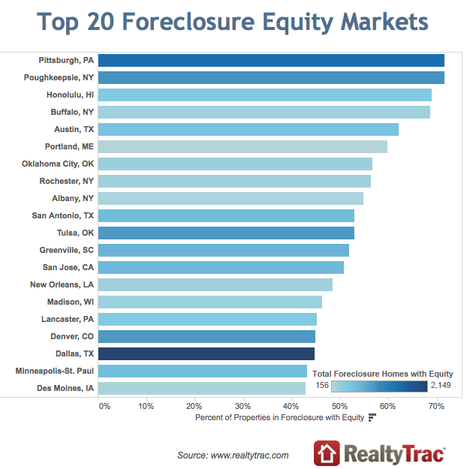 Somewhat amazingly, 72% of foreclosures (1,541 homes) in Pittsburgh have some level of equity. It is followed by Poughkeepsie, NY at 71% (1,065 homes) and Honolulu, HI at 69% (451 homes). The largest number of homes in foreclosure that have positive equity can be found in Dallas, Texas, likely because of their strict lending rules that limit cash out to low LTVs. This sheds some light on the causes of the crisis as well, and backs up a study by Fed researcher Steven Laufer that blamed cash out loans for the large number of defaults and eventual foreclosures. What it all means is that there is going to be a lot more housing inventory now and in the near future, assuming homeowners finally pull the trigger. Apparently a good chunk of them are waiting for prices to rise further before selling, but you’ve got to believe that more and more will take the plunge as prices continue to rise and higher rates thin the eligible pool of buyers. Additionally, because more homeowners are gaining equity, there will be fewer and fewer short sales and foreclosures. That too should bolster home prices, as distressed sales drag down prices. These sellers may also become subsequent buyers sooner if they can avoid a fire sale and keep their credit clean, all of which should help the housing market recover. The only concern is an eventual tipping point where there is too much overpriced inventory. But hopefully that is some years out.